Norwegian Breakaway began making her first public appearance this morning just after 7:00am in Germany as the giant door to Meyer Werft's covered building dock was opened and the 146,600-ton ship was towed out into the lagoon. Regular readers will note that the ship is coming out bow first. While Meyer's ships usually make their appearance stern first, this isn't unprecedented, as last spring AIDAmar also came out bow first. Norwegian Breakaway is the largest ship produced to date by Meyer, but it will be eclipsed by Quantum of the Seas when it is delivered a year and a half from now. 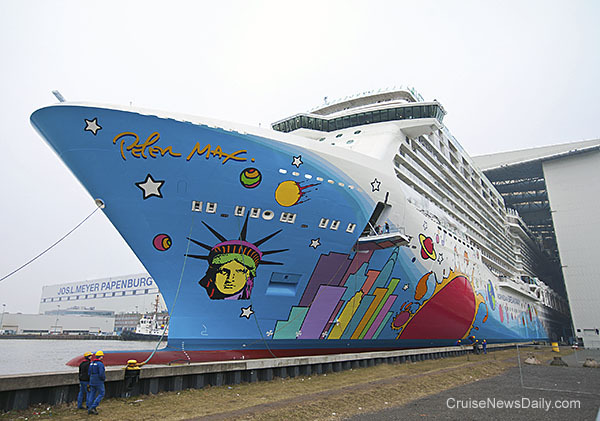 With its Peter Max hull art, Norwegian Breakaway is one of the most colorful ships Meyer has ever delivered. The next event for Norwegian Breakaway is its river conveyance, which is tentatively set for March 10. Delivery is scheduled for April 25. 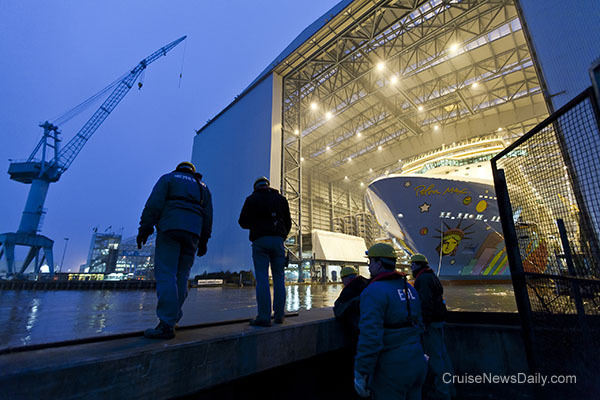 The complete story appeared in the February 26, 2013 edition of Cruise News Daily.